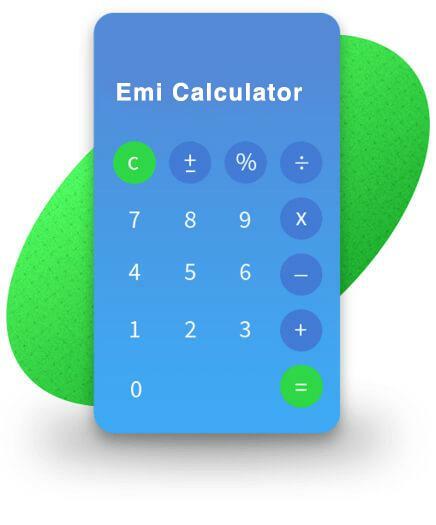 EMI Calculator – Calculate Loan EMI in 3 Easy Steps. Use our EMI calculator to estimate your Home Loan EMI and also analyse interest and outstanding principal repayment. How to use this EMI Calculator? EMI will be calculated instantaneously when you move the sliders. Consider that you have borrowed some money from your friend, but you are not able to return the entire amount at one shot. You both then decide that you would pay back a part of the due amount every month over a period of time at a certain interest rate until you pay him back in full. This is nothing but Equated Monthly Installments or EMI. EMIs are a predetermined sum, a borrower pays to his lender over a period of time until his loan extinguishes. Here, the borrower could be you and the lender could be the bank that has given you the loan. How does an EMI Calculator Work? where, P, R, and N are the variables, which means the EMI value will change every time you change any of the 3 variables. Let’s discuss these 3 variables in detail. ‘P’ denotes the ‘Principal Amount’.This is the original amount lent to you by the bank/lender. The loan amount will depend on your need and the purpose of the loan. Higher the loan amount, the higher will be the EMI that you pay for the loan taken. R represents the ‘Rate of Interest’.This is the rate at which interest is charged on the principal loan amount. The interest rate will vary according to the type of loan taken and the lender (bank) from which you are taking the loan. The rate of interest has a direct bearing on your EMI amount; hence, it is important to compare interest rates across banks before opting for a loan. N indicates the number of years for which the loan has been taken. This period is known as the tenure. The tenure of a loan refers to the total time period given for the repayment of the loan. Since the repayment is done every month, the tenure is calculated in months and not years. So, a tenure of 2 years is equal to 24 months, and so on. Home Loans is one of the most common bank loans taken every year. They usually tend to have a large principal and a longer tenure. This is why it is very important to make all your calculations well before you take a home loan. Our easy-to-use Home Loan EMI calculator will let you know how much EMI you need to pay for the loan amount, so that you can have your finances in order before approaching the bank. The comforts of the car can lead to a greater discomfort in your budget if you do not take calculative steps. Prior to buying your dream car, be sure to run the numbers through our Car Loan EMI Calculator. There are many schemes available in the market for buying cars, which can be very tempting. However, it is important to remember that if you are unable to pay your car loan amount in full, your vehicle can be repossessed by the banks. The cost of education appears to be on the rise every year, and if you are planning to send your child for a higher education, you may be in need of an Education Loan. Generally, these loans come with a moratorium period so that one can start paying off the loan only after the education is complete. You can use our Education Loan EMI Calculator to find out the EMI amount you will have to pay for this loan. If you have any residential or commercial property, or land registered under your name, you can use this as a collateral to obtain a loan against property (LAP). These are secured loans, where you mortgage property as security. You can use our Loan Against Property EMI Calculator to understand how the EMI scheme works in this case. Principal Loan Amount: This is the original amount lent to you by the bank/lender. The loan amount will depend on your need and the purpose of the loan. Higher the loan amount, the higher will be the EMI that you pay for the loan taken. Tenure: The tenure of a loan refers to the total time period given for the repayment of the loan. Since the repayment is done every month, the tenure is calculated in months and not years. So, a tenure of 2 years is equal to 24 months, and so on. Rate of Interest: This is the rate at which interest is charged on the principal loan amount. The interest rate varies according to the type of loan taken and the lender (bank) from which you are taking the loan. The rate of interest has a direct bearing on your EMI amount; hence, it is important to compare interest rates across banks before opting for a loan. What is Loan Amortization Schedule? As you keep paying your EMIs, the original principal amount keeps reducing. Over time, the interest on the loan amount decreases and the principal part of your EMI increases. At the end of the tenure, you would have paid off the principal amount in full. A Loan Amortization Schedule keeps track of this EMI breakup, so you know exactly what portion of your EMI has been used for paying interest and what is used to reduce the principal. This schedule can be very helpful in understanding prepayment of loans and for refinancing, if required. There are several factors that affect the EMI calculation. Since the EMI depends on the principal amount, tenure, and rate of interest, any change in these variables can cause a change in the EMI amount. Change in interest rate: Loan interest rates can be fixed, floating, or hybrid. In case of a fixed interest rate, the rate remains the same over the loan period. A floating interest rate is linked to the MCLR (Marginal Cost of Funds Based Lending Rate) and can change multiple times over the loan period. This may change the EMI calculation for your loan. A loan with a hybrid interest rate has a fixed interest for a certain duration, after which the interest rate is decided by the MCLR. The EMI can change even for such loans. Change in tenure: If you change banks and carry over your loan to the new bank, the tenure of your loan may change in some cases. This will affect your EMI calculation. The EMI can decrease if the tenure increases and vice versa. Prepayment of loan: If you prepay your loan, the prepayment amount will be deducted from the original principal, effectively reducing your loan amount. If the tenure remains the same, the EMI can either decrease or stay the same. In the latter scenario, the portion of the EMI used for repaying the principal will increase, since the effective interest would be lesser than the original calculation. Accessibility: You can use the EMI Calculator anytime, anywhere and make your budget calculations. Accuracy: Using a EMI Calculator is more accurate than calculating the numbers yourself. Financial Planning: As stated above, EMI calculations need to be done even before you start your loan application. A EMI Calculator can help you with this. Q: How can I use the EMI Calculator to find the best loan for my need? A: You can use the EMI Calculator to compare loans from different banks, as each bank has its own interest rate. The tenure may also differ from bank to bank. This way, you will be able to find the best loan with the least EMI that suits your goals as well as your pocket! Q: Are EMI Calculators more accurate than Excel Calculators? A: Well, they are definitely more handy! An Excel can also give you correct results as long as you are well-versed in it. Alternatively, you can use a EMI Calculator to get the results within seconds. Q: Will the EMI calculated by the bank be different than that calculated by the EMI Calculator? A: The EMI Calculator will calculate numbers according to your inputs. If when taking the loan from the bank, you find that there are differences in tenure, interest rate, or actual principal amount (post deductions) as stated by the bank, then the EMI calculated may vary slightly.